What I see here is that fundies are losing the battle and that they are getting so desperate they make the lives of people around them miserable. As for the last sentence, just another proof that antisemitism never falls far from the religious tree. Being gay isn't a cause of suicide, fundies are - they drive other people to it. Jonathan Edwards: The only thing killed was his faith. Meanwhile, today is the first day of the rest of his life. I guess the reason why he became an Atheist: yet lives on still, is because he finds your faith disturbing. Your failure is now complete. ...and you got your line charts from...? Hard to "kill" something that doesn't exist. If you feel your life lacks meaning without an invisible friend/master, then you need to look more closely at what you're doing in life. You make your own reasons for living. So, what's the takeaway, here? My atheism is born from my search for God, for some reason to believe God is real. I haven't found one. If that leads me to suicide, that's a consequence of trying to understand the universe. Are you saying that it's more important to adopt a false belief, for the sake of emotional stability, or something, than to face the universe honestly? You've misunderstood Nietzche. When he said "God is dead" he meant that Christianity was no longer underpinning the Western world as a source of values. Wouldn't an angry sky daddy kill people himself? Also the second graph is in real numbers, not percentages. There are more /people/ now. How has the /rate/ of suicide changed? I would probably say it's gone up, anyway, because you dillholes are torturing people daily, but also because people who are in horrible, unending, uncurable pain and are not religious feel more freedom to end their lives. Corrected to rate per 100,000 people, it's still higher, although the increase is significantly less dramatic. It also doesn't correlate with the increase in irreligiosity in any way that a reasonable person would see as suggesting direct causation. 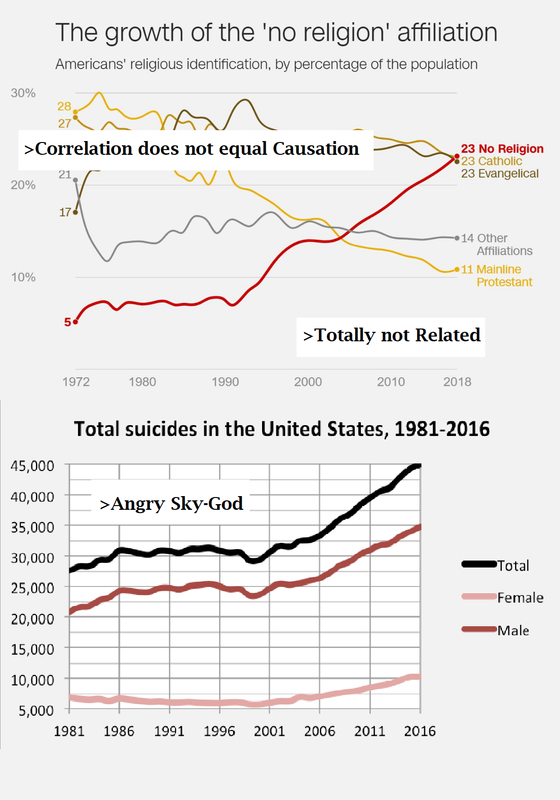 Where irreligiosity has increased basically throughout the entire period under consideration, rates of suicide dropped from 1986 until around the turn of the 21st century. Rates by state also don't follow the trend that these guys want them to. The states topping the list of suicides per 100,000 people are also some of the most religious states. That's likely to have more to do with liberal gun laws than anything (the exceptions, like Vermont at 17th place for suicides despite having one of the lowest levels of religiosity in the US, are informative) but that kind of fucks with two of the far right's most beloved narratives. I burned myself trying to make tea yesterday. I guess the Jews were behind that?